Get 33/1 Arsenal or 40/1 Tottenham to win the North London Derby at Betfair! 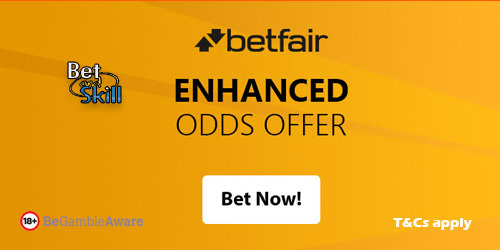 The first North London Derby is just around the corner and Betfair are offering enhanced odds on the match - 33/1 Arsenal to win or 40/1 Tottenham to beat the Gunners + £100 in free bets! Arsenal haven’t won any of their last six Premier League meetings with Spurs (D4 L2) but they have won their last nine Premier League home matches. Tottenham, who have won 5 of their last 6 league matches, have not won any of their last seven matches away to Arsenal. Are you backing a side to win? Claim 33/1 Arsenal to beat Spurs or 40/1 Tottenham to beat the Gunners! Plus, get £100 in free bets as new customer! Place your first bet (max £/€1) on Arsenal or Tottenham to win Saturday's fixture! Place a bet on Arsenal or Tottenahm in the 'Match Odds' market at the enhanced price on the Sportsbook. Max stake £1. "Get 33/1 Arsenal or 40/1 Tottenham to win the North London Derby at Betfair!"